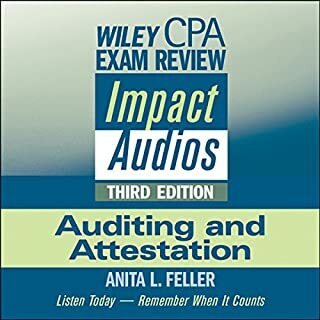 Wiley CPA Exam Review Impact Audios: Auditing and Attestation, Third Edition contains dynamic lectures on vital parts and modules of the new computerized CPA Examination including simulations. Completely revised and updated, the audios provide coverage of the new standards for fair value measurements, FAS 157 and the fair value option for reporting financial assets and financial liabilities, FAS 158. Too much information for an audio book. 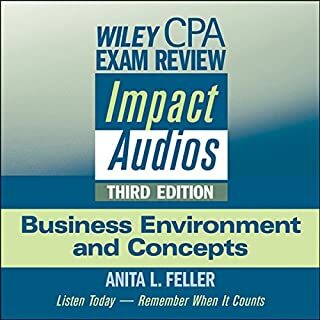 Wiley CPA Exam Review Impact Audios: Business Environment and Concepts, Third Edition contains dynamic lectures on vital parts and modules of the new computerized CPA Examination including simulations. Completely revised and updated, these invaluable and in-depth audios are designed to be used on audio devices. Poor audio quality but Great value! Wiley CPA Exam Review Impact Audios: Regulation, Third Edition contains dynamic lectures on vital parts and modules of the new computerized CPA Examination including simulations. Completely revised and updated, the audios provide coverage of the most recent tax law changes, the latest business law legislation, and AICPA and PCAOB ethics rules. Passing the CPA exam can change your life. It changed mine. 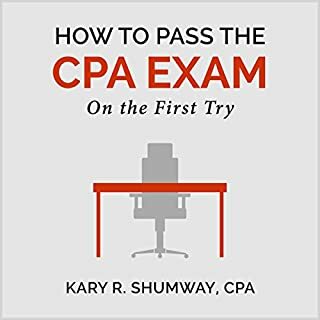 This short guide provides you with the strategies and tactics, tips and techniques that I myself used to pass the CPA exam. I hope you find the ideas useful as you prepare to sit for, and pass, the exam. Three comprehensive manuscripts in one audiobook. Get this audiobook now and learn more about accounting! Whether you're a small business owner or just want to understand your 401(k) statements, this new edition of Accounting for Dummies helps you get a handle on all those columns of numbers. With fully up-to-date accounting basics for business and personal finances, this audiobook will help you to balance your books and stay in the black. Three comprehensive manuscripts in one audiobook. This audiobook is intended for people who want to know something about the fundamentals of bookkeeping and accounting without necessarily becoming a certified bookkeeper or accountant. Many people are in this position; small business owners, employers, employees, business owners, stockholders, investors, and many, many more. Most of these folks do not need a deep understanding of bookkeeping or accounting; they just need to learn what it is and how they should be using it. Learned more about accounting then I had in class. Accounting is a crucial part of any successful business as it records all profits, losses, credits, and debts and tells you the state of the business. This audiobook will provide you with the most vital knowledge on accounting and business growth as well as how to protect your business against fraud. Impact Audios: Regulation contains dynamic lectures on vital parts and modules of the new computerized CPA Examination. The audios are designed to facilitate memory and reinforce key concepts. They are filled with mnemonic devices, exam strategies, and a thorough review of the skills and concepts needed to pass the exam. Here is a perfect introduction to financial accounting for non-financial managers, stock market investors, undergraduate business and MBA students, lawyers, lenders, entrepreneurs, and more. Most introductory finance and accounting books either fail because they are written by accountants for accountants or the authors "dumb down" the concepts until they are virtually useless. Financial Statements deftly shows that all this accounting and financial reporting stuff is not rocket science and that anyone can understand it! Every business owner should know the concepts of financial accounting. 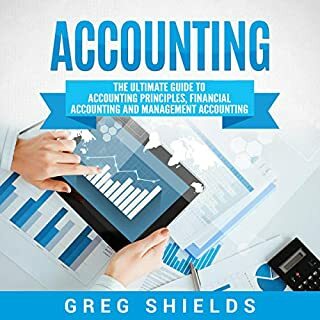 This audiobook is intended for people who want to know something about the fundamentals of financial accounting without necessarily becoming an accountant. By listening to this audiobook, you'll learn the basics of financial accounting and how to record your business transactions. You will get equipped with the ratios and other tools that can be used for performing your analysis of the income statement, balance sheet, and statement of cash flows. The Impact Audios contains dynamic lectures on vital parts and modules of the new computerized CPA Examanination. The audios are desinged to facilitate memory and reinforce key concepts. They are filled with mnemonic devices, exam strategies, and a thorough review of the skills and concepts needed to pass the exam. Over the course of this audiobook, you're going to learn a whole lot about many different topics: from risk assessment to the different types of audits, all the way to how to perform all of them and file a report. You'll also discover how auditing relates to accounting and how you yourself can be a great auditor and perform your job extremely well. Knowing the concepts of management accounting can have a very positive impact on your business. Through management accounting, you can create forecasts for the future, make smart buying decisions, analyze the rate of return on an investment and much more. Management accountants do a lot when it comes to the management aspect of running a business. Perhaps you are a management accountant, thinking of becoming one, or will be hiring someone who is proficient in the field. If so, this book is for you. Poor book, I wonder if all these 5 stars are fake! Discover how you can improve your financial skills and learn more about corporate finance in this five-audiobook bundle. You'll learn about competitive analysis, customer checks, how to mitigate risk, how to make the right acquisitions by asking the right questions, how to analyze your business' performance, and much more. The CPA Audio Study Guide is an essential part of your study efforts for the CPA exam. It contains summaries and questions and answers. Clear, easy-to-understand rationales are also provided to help develop critical thinking. Ideal for busy students. it can be enjoyed while at the gym or walking around campus or stuck in rush hour traffic. Do you want to learn accounting quickly and with ease? 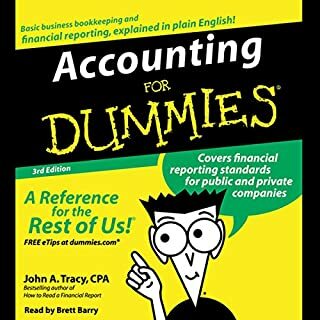 This accounting audiobook could be the answer you're looking for.... How many times have people shunned away from accounting? What many do not realize is that accounting is in our day-to-day lives. If you have ever balanced a checkbook or kept a ledger for your bank accounts, then you are performing an accounting operation. In this book, we will expand on those simple tasks by showing how they relate to accounting. Then we will build on that to develop your knowledge of accounting. By the time you've finished Accounting for the Numberphobic, you'll be reading your financial dashboard like a pro. This audiobook takes the terror out of accounting, as it demystifies - in plain English - documents like the Net Income Statement, Cash Flow Statement, and Balance Sheet. Great book for the entrepreneur! Wiley CPA Exam Review Impact Audios: Financial Accounting and Reporting, Third Edition contains dynamic lectures on vital parts and modules of the new computerized CPA Examination including simulations. Completely revised and updated, the audios provide coverage of the Sarbanes-Oxley Act and the latest coverage on the Public Company Accounting Oversight Board auditing standards. This best-selling audio set facilitates memory and reinforces key concepts through the use of mnemonic devices, exam strategies, and a thorough review of the skills and concepts to prepare CPA candidates to take - and pass - the CPA exam. ©2009 Wiley Publishing Inc. (P)2009 Wiley Publishing Inc. If the version of this book offered were more up to date. This version is not relevant. Has Wiley CPA Exam Review Impact Audios turned you off from other books in this genre? What didn’t you like about the narrator’s performance? I passed FAR and this REALLY helped. I just downloaded the next section. GOOD LUCK! The speaker goes so fast that you barely have time to comprehend what she is saying. There is a lot of material to cover, but unless you like to listen for a bit and then pause to digest it you won't get much out of this audiobook. Bookmarks or better chapters should be added. It is nearly impossible to find a topic that you need to review really fast because the audiobook is broken into the 5 CDs from the original release. There are no useful chapters or bookmarks included. I recommend this book as a supplemental study method to use when you can't get to your computer or book. It does help reinforce your previous studies. This helped me a lot to drive home some hard to understand chapters. I listened to it without any distractions and its easy to navigate/skip through chapters. I read each chapter before listening to the wiley audio and would recommend that you do likewise. all the best! The narrator sounds pleasant, but is very unengaging. She talks too fast to give you time to absorb the consequences and provides too few examples of use on the exams or in real life. Where does Wiley CPA Exam Review Impact Audios rank among all the audiobooks you’ve listened to so far? This is the first audio book that I have listened to. I like that I can learn the information on the road. What does the narrator bring to the story that you wouldn’t experience if you just read the book? I think hearing someone talk to me over and over is a bit more sticking than reading it over and over, but I still read the material just to get a grasp of the information. Regarding studies, repetition is key. I can't say that there was. It's all informational and I appreciate the additional study methods. The only thing that I don't like is that when I burn to CD's all the tracks are in increments of 8 minutes each and the transition from one "track" to another isn't to my liking. There is no pause. Other than this, I love listening to the CDs on my way to work every morning. It sticks. this audio book was very helpful and it was available for only 1 credit! awesome! nice to listen to on your commute. the material is outdated, but over all can have some good concepts. Easy to listen to.